Sunday February 28- 1932 I felt much better today. I went home with Ott for dinner. William brought me home about four oclock. 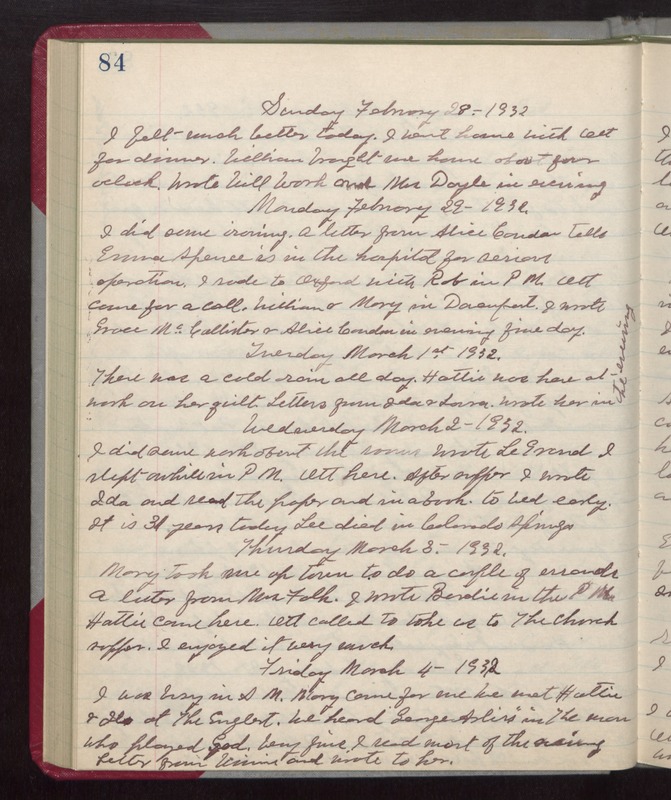 Wrote Will Work and Mrs Doyle in evening Monday February 29- 1932. I did some ironing. A letter from Alice Condon tells Emma Spence is in the hospital for serious operation. I rode to Oxford with Rob in PM. Ott came for a call. William & Mary in Davenport. I wrote Grace McCallister & Alice Condon in evening fine day. Tuesday March 1st 1932. There was a cold rain all day. Hattie was here at work on her quilt. Letters from Ida & Laura. wrote her in the evening Wednesday March 2- 1932. I did some work about the rooms Wrote LeGrand I slept awhile in PM. Ott here. After supper I wrote Ida and read the paper and in a book. to bed early. It is 31 years today Lee died in Colorado Springs Thursday March 3- 1932. Mary took me up town to do a couple of errands A letter from Mrs Falk. I wrote Birdie in the PM. Hattie came here. Ott called to take us to The Church supper. I enjoyed it very much. Friday March 4- 1932 I was busy in AM. Mary came for me We met Hattie & [Ilo] at The Englert. We heard George Arliss in The man who played God. Very fine. I read most of the evening Letter from Winnie and wrote to her.